Custom purple & white 60” arc auto open golf umbrellas can fix the spotlight for even duller campaigns. 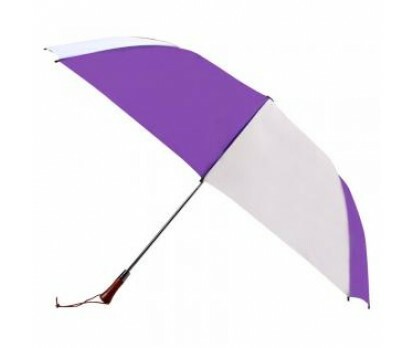 This umbrella features sturdy handle, steel frame and nylon canopy with alternating purple and white bands – which adds to its utility as well as aesthetic appeal. Promotional purple and white 60” arc auto open golf umbrellas can be either used for representative purposes during outdoor campaigns or it can be used indoors as a fashion accessory. Marketers who are working with larger marketing budget can seek personalized purple & white 60” arc auto open golf umbrellas for business gifting, too. It is for sure that people cannot ignore it because the umbrella strikes them with its charming color profile. Imprint area - 10"W x 8"H. Dimensions - 60" arc - Closes to 22.5".